Relate: I remember a time when I was walking through the mall in Syracuse, NY, and I happened to hear a mother sternly lecturing two of her children. I’m not sure which oof the kids spoke or what exactly they said, but the mom’s finger came out and she wielded it in their direction with an angry force. She said, “I don’t care what you want. You sit there and don’t move until I find your brother.” Those two kids sitting sullenly on that bench were preteen or perhaps early teens and my guess was that their brother was the oldest in the family. But what if he wasn’t? What if their brother wandering around that mall was only five? What if he didn’t get caught up playing the one of the sample games in in the electronics store but rather had been marked out and picked up by some twisted predator? Imagine that mother’s stern lecture gradually giving way to nervous calling and then frantic hunting. I’ve heard over public address systems more than my share of Code Adam’s and Amber Alerts. Behind each of those alerts is a frantic parent desperate to find their child. They worried sick that something dreadful might have happened. Until that child is found they are under an obsession and nothing will deter them from their task. React: If we, who are imperfect sinners would act this way toward our children, how much more so does God? He knows that obsession. God shares it. The “religious” people of his time asked, “Why would you hang out with that crooked IRS agent? Shouldn’t you be avoiding that kind of evil?” I can hear Jesus response, “Do you see Zacchaeus? He is why I have come. He is my obsession. To seek and save the lost I will do anything and go as far as the grave and beyond.” While God is obsessed about the lost, we are all too often sitting on the bench like petulant teens whining about those petty things we want. Will we help in the search or are we going to be a distraction that He needs to sideline? God, I don’t want to just sit on the sidelines. Don’t bench me because my own greed and petulance is a distraction from what You are obsessed to do. Your heart burns for the lost. Let my heart burn with the same. Help me to give up anything, go anywhere, even as far as the grave for the one. Let me leave the ninety-nine behind and join with You in that desperate search until all have come to know You and acknowledge You as Lord. I needed this today. I have been feeling bullied and lost. Thank you for the reminder that I am never lost or unloved in Gods heart. Hi Beejai: Good article but I have to disagree with one statement. “If we, who are imperfect sinners….” When we asked Christ into our life we were redeemed by His blood and we are no longer sinners. We sin but we are “saints” not sinners. Sinners are the non-believers. Maybe you don’t sin anymore but I sure do. Yes, positionally my sins have been taken and I have been imputed with the righteousness of God, but in my actions, though I regret and repent, I am still a sinner. This encouraged my soul…I truly appreciate you sharing it. I ABSOLUTELY LOVE THIS…great piece to read on a Monday. I really appreciate the analogy you used in this post. We are often so careful not to use “crazy-sounding” words when talking about God, that we water down what He’s really doing for us. I like the idea that He’s obsessed with us–He’d have to be to send His own Son to die for us. 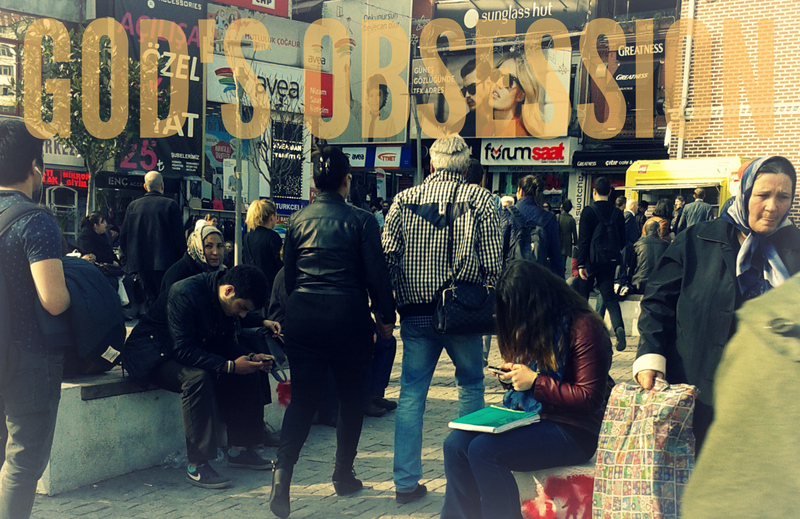 Thank God for His obsessions! I look forward to reading more. May God continue to bless your endeavors!